You’ve probably heard it already. The Southgate Ballad. Sung to the tune of Whole Again, the definitive track of Atomic Kitten – the group sandwiched between Spice Girls and Girls Aloud – that ended up as the 13th best-selling single of the 2000s. It’s also largely sung to the words of Whole Again, with only the final line being notably different from the original (plus Baby for Southgate). Yet this seemingly modest little number might just be the greatest England song of all time, carrying in its words the weight of a history both national and intensely personal, a hymn celebrating this currently golden summer while remembering and redeeming a rather less golden past. Think the above sentence is a little strong? Fine. Here’s a line-by-line analysis (all five of them) to support my argument. Be warned: it’ll take you a lot longer to read than the song takes to sing. What's brilliant about this lyric is how it means something different for every single person singing it: different tournament, different match, different heartbreak. Or often the same heartbreak but seen from a different angle, so to speak. We all once discovered England for the first time, and unless that first time came in 1966 we were all ultimately left devastated by the experience. Yet still we celebrate it, because without that first experience we wouldn't have everything else that came after it: more heartbreak, yes, a lot more heartbreak, but also hope, excitement and fleeting joy. We wouldn't be dancing on the tables, hugging strangers, singing at the top of our lungs. And every time I sing I remember being six years old and my Dad controlling the future because when you're six years old that's what Dads can do. The supporter's experience encapsulated in seven words. Masterful. Part of me feels it should be “I cannot forget but I cannot escape” because what we remember most vividly are the defeats, the red cards, the goddam shootouts, yet still we come back for more, still there's a voice that whispers 'maybe this year. If Kane carries over his club form and the defence hangs tight and we avoid a big boy till the quarters then maybe this year' and then we lose to Iceland in the round of 16. Even the good times – and since 1990 the good times have amounted to a handful of group-stage victories and knocking out Denmark and Ecuador – are largely eroded by the Bad Times that followed. It's hard to be nourished by Defoe's winner against Slovakia when you know we're getting thrashed by Germany next match. Yet the actual formulation is the better formulation: every true fan understands that victory and defeat, the late winner and the late concession, do not exist in opposition but in harmony, hand-in-hand – football need both to balance its Force. (And if one overwhelms the other we end up with PSG or Darth Vader.) Hence why the conjunctive must be “and”, not “but” – whether it's our last minute winner or their last minute winner we'll always carry it with us. And I haven't even touched on the magnificently bleak notion that being a football supporter, especially an England supporter, is a state of mental imprisonment we all deep down aspire to escape from because frankly how many 0-0 with Algerias can a soul endure? Bar Henderson, who gets a pass, 12 men have failed in penalty shootouts for England – (deep breath) Pearce, Waddle, Southgate, Ince, Batty, Beckham, Vassell, Gerrard, Lampard, Carragher, Young, Cole – yet it is Southgate who somehow came to embody the failure of national bottle. There are several reasons for this. Firstly, Southgate is unique in being the sole failure of his shootout: the rest either came in pairs – 1990, 1998, 2004, 2012 – or God, help us, the unholy trinity of 2006. Misery loves company, eh? Yet Southgate was forced to shoulder his burden alone, and it must have felt twice as heavy. His miss occurred at Wembley Stadium in the semifinals of Euro 96, the year of the original Baddiel and Skinner Three Lions, and the second and last penalty shootout which legitimately might have cost us the tournament rather than defeat in the following round. And while I don’t remember Euro 96, I’m reliably informed by everyone who does that Southgate missing was known to be an absolute certainty the moment he placed down the ball. With deference to hindsight, I can’t imagine a swell in national confidence at the sight of the fragile, skinny young thing, a grey slip on a sea of green, hurrying forward to meet his destiny with the air of a man who knows what’s coming and is keen to get the whole nightmare over with so he get on with learning to live with it. Also, that Pizza Hut advert didn’t help. That the physical embodiment of 52 years of hurt could be the one – or rather The One – destined to finally end it is beyond poetic, it’s the stuff of legend. The man who first sent fotball away will ultimately bring it home again. He Who Journeyed Furthest Into The Darkness Will One Day Lead His People Into The Light. The only possible way to top this would be for Gareth to exploit some little known loophole to name himself in the squad for the specific purpose of subbing himself on in extra time of the World Cup Final and banging home – no, slotting home, in the exact same spot as 96 only this time the keeper dives the other way – the decisive penalty in the shootout but he’s far too sensible a man for that. Plus it would need to be against the Germans, and they went out in the group stage. He’s a good-looking man our Gareth, aging like a fine wine. Filled out a bit since his playing days, grown a nice beard. Soulful dark brown eyes. One of the best noses in the business, a battered and noble ridge running proudly down a handsome, equiline face. A style icon, too, with his waistcoat and immaculate tailoring. One of the good guys. Damn right Gareth Southgate turns me on. He turns me on more and more every match. But that’s way too straight an analysis for our deep dive. So let’s focus on the “still” and its implication that Southgate turned us on in the past, specifically when he was an England player as every England player turns us on, from David Beckham to whoever you’re thinking of right now. 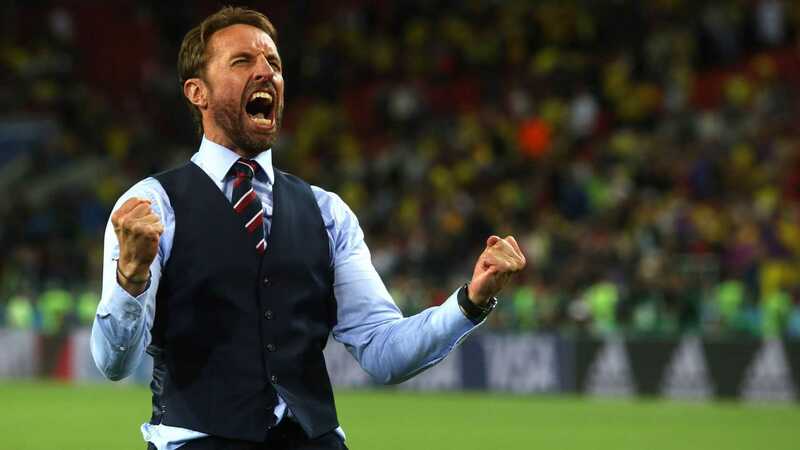 As noted above, Southgate’s England career on the pitch isn’t a tale of unqualified success yet we accept his failing and love him all the same; in fact our love is heightened because we know Southgate wants this more than any of us. Football is a game of abuse, often sickeningly so, but it is also a game of forgiveness: even players heckled by their own fans due to perceived incompetence tend be applauded fondly when they jog out for the benefit match of an ex-teammate or are interviewed on the pitch at half time. Finally, why the ‘You’ appears to be Southgate, it could also be extended to the England team and become a broader expression of loyalty and faith. Till death or the quarterfinals do us part. I watched the Colombia game in a pub so packed it felt like a mosh pit. The mood changed from optimistic to celebratory to stunned to desolate. In the break between the final final whistle and penalties that would surely send us out, the whole room broke into the Southgate Ballad one last time. Whereas at 1-0 up, the final line rang out like promise, now it sounded sad and defiant, the final war cry of a doomed campaign. A dream of a better future, a footballing echo of “Next year in Jerusalem” or “Tiocfaidh ár lá” if the comparison can withstand its inherent crassness. Maybe not this year, maybe not 2022, but one day, one glorious day football will come home again. And then of course we won and the song became a celebration once again. Like Three Lions, it has the versatility of the truly great. And finally, of course, it helps that Whole Again is a cracking tune (did I mentioned it was the 13th best-selling single of the 2000s?) and the popularity of the Southgate Ballad owes us much to Natasha Hamilton, Liz McClarnon and Kerry Katona (and their songwriters) as it does to Harry Kane, Jordan Pickford and Gareth himself. Who knows? You shouldn’t think too hard about these things.